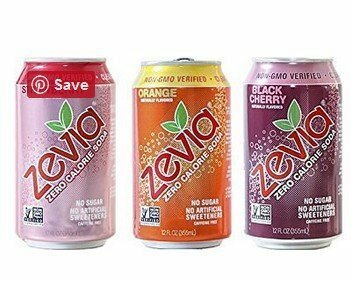 Zevia Zero Naturally Sweetened Soda variety pack lets you try a rainbow for flavors. The pack includes two cans of 12 flavors including: Cola, Ginger Root Beer, Ginger Ale, Cream Soda, Grape, Black Cherry, Lemon Lime Twist, Orange, Mountain Zevia, Dr. Zevia, Caffeine Free Cola and Grapefruit Citrus. All the soda is clear no matter what the flavor is and contains no artificial colors, unlike almost all other sodas. There are zero calories and zero grams of sugar per can/serving due to the presence of stevia, erythritol and monk fruit extract all of which are natural sweeteners. Stevia is extracted from the stevia plant while Monk Fruit extract comes from a gourd that looks more like a small, green melon. Both are considered safe by the FDA and have been studied do not have an impact on glucose levels in the body, making them safe for diabetics. Erythritol comes from algae or lichens and also has no impact on glucose. A note on carbs: each label will say that it contains zero calories but also has 4 grams of carbs which seems like it would be impossible. However, those carbs come from erythritol, sugar alcohol. The reviews for the Zevia Zero sodas were somewhat of a mixed bag. While there were over 500 positive ratings (out of 747), there were 107 1-star reviews. Many felt the flavors were not enough or flatout declared the taste “awful” with some having issues with aftertaste and bitterness from the monk fruit and/or stevia. This is one of those products you are likely going to have to try to see if you, personally, like it then decide if the taste and nutritional value is good enough to keep buying.